Named after the God of Commerce and knowledge, Hermes, Ermoupolis literally means "the city of Hermes". In the aftermath of the 1821 revolution, Syros became a haven for refugees from the regions destroyed by the Turks and in a few short years Ermoupolis was turned into one of the most important ports of the country with an active economic and cultural life. 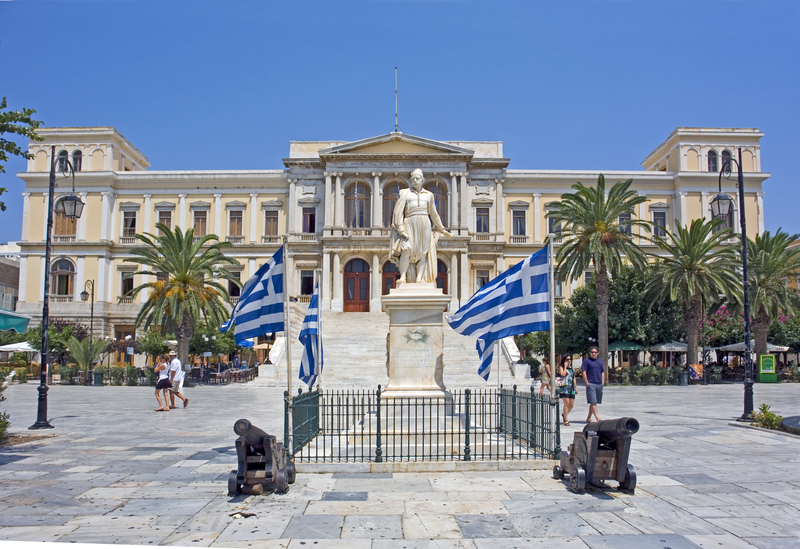 Today, Ermoupoli is a beautiful town with marble paved streets, grandiose public squares, impressive churches and old mansion houses displaying a unique architectural style influenced by neo Classicism and the Venetian school with a mixture of Western features. A special feature of Ermoupoli is Miaouli square, where a tall palm tree shadows small coffee shops and restaurants. Surrounding the square is the magnificent neoclassical building of the Town Hall. Apart from the municipality, this architectural marvel also houses the Archaeological Museum. 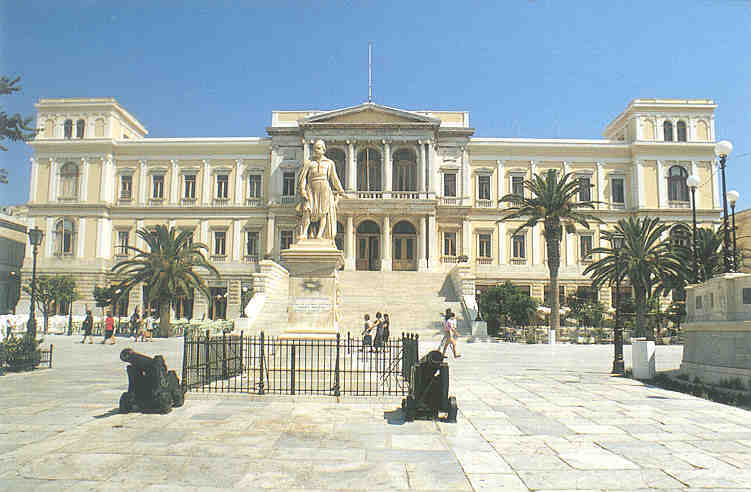 On Miaouli square there is also the "Ellas" Cultural building of Ermoupolis, a beautiful building with high painted ceilings, where various cultural activities take place throughout the year and where the public library is housed. In addition, worth visiting is the Apollo Theatre, a mini copy of La Scala in Milan. 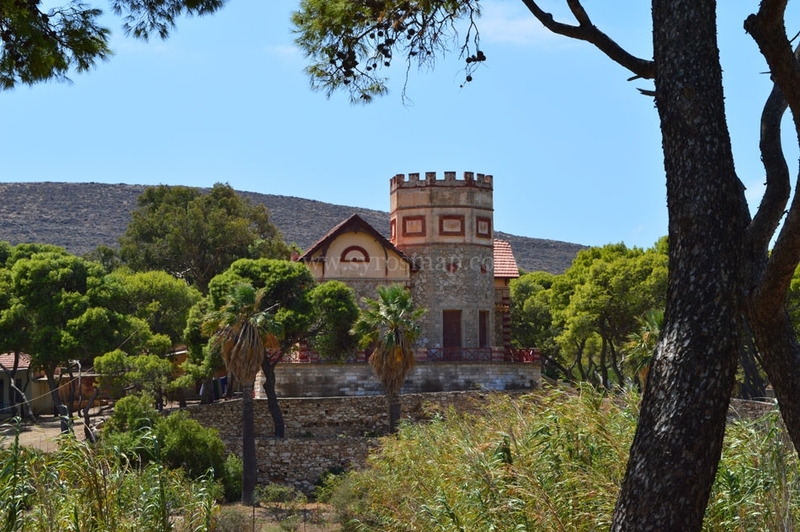 Ermoupolis has a number of beautiful churches, such as Metamorfosi tou Sotiros, Kimisi tis Theotokou and the richly decorated Agios Nikolaos Church which is the pride of Hermoupolis. 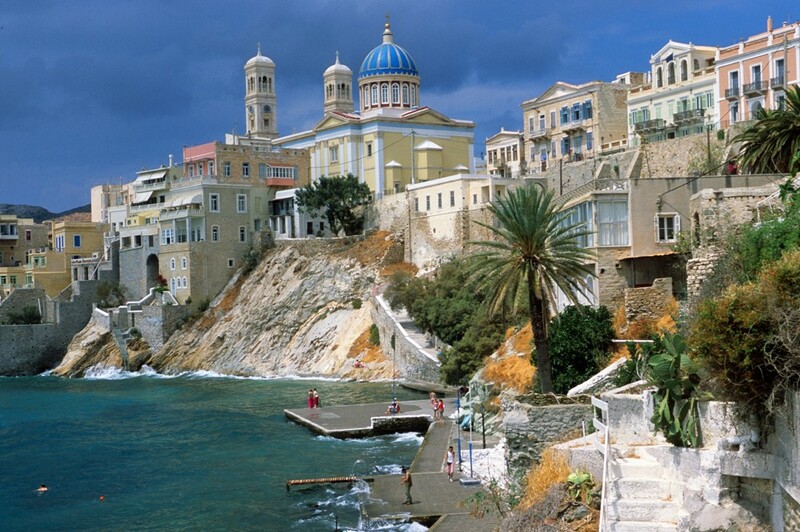 On a hill above the town, dominated by the Catholic Cathedral of St. George, is the picturesque and mostly catholic quarter known as Ano Syros. The architecture of Ano Syros has nothing in common with that of the neoclassical Hermoupolis despite being so close to each other. A characteristic of Ano Syros is the medieval architecture combined with the typical Cycladic influences. Houses are built closely, one on the top of the other and surrounded by rocky slopes which created a protective fortress against pirates and other enemies that threatened around 1200 AD. Today the wonderful scenery of narrow winding alleys linked by whitewashed steps and archways, wooden doors and balconies plus small courtyards filled with a plethora flower pots charms every visitor wondering around Ano Syros. 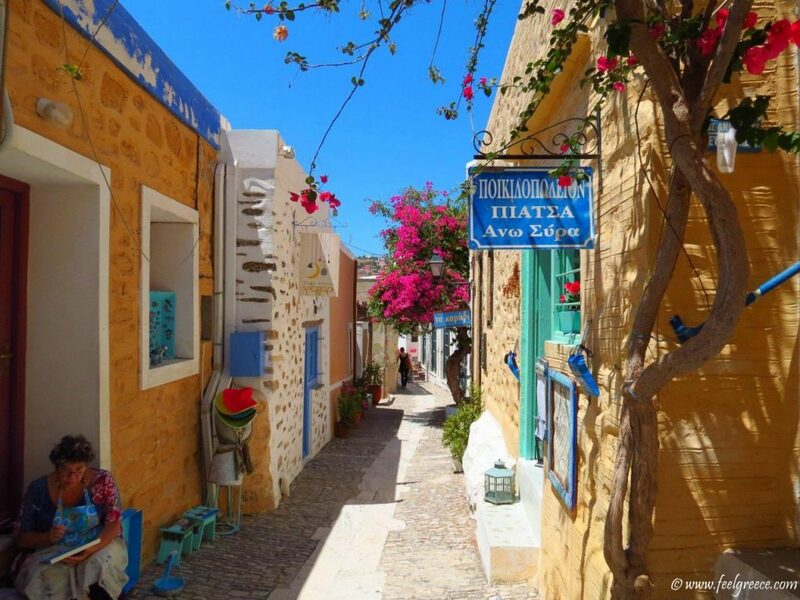 Piatsa is the "commercial centre" of Ano Syros with numerous tavernas, shops, small galleries, etc. It is also home to a small museum housing the personal effects and records of Markos Vamvakaris, a famous rebetiko composer, singer and bouzouki master who was born in Ano Syros. Approximately 8 kilometres west of Ermoupolis is the seaside village of Galissas. Galissas beach is also well protected from the winds. 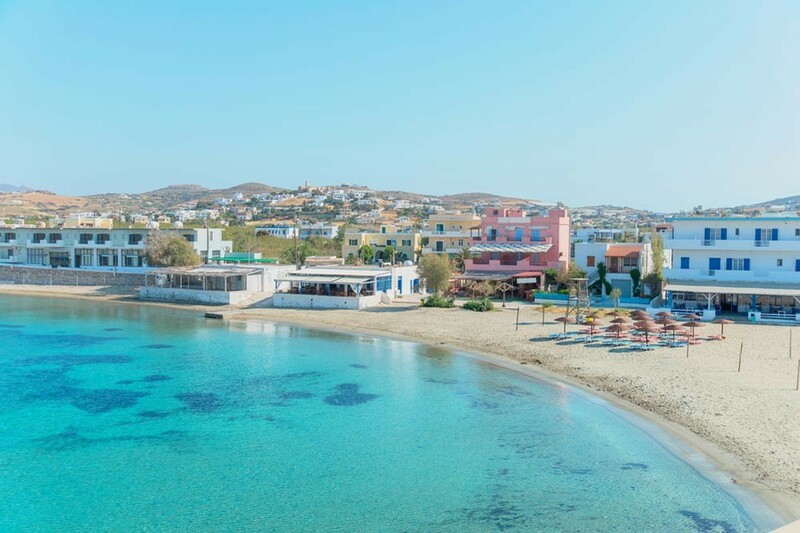 One of Syros' finest and most popular beaches, extending for about one kilometre, it has golden sand and tamarisk trees for shade when the sun gets too much. Popular during the summer months due to the long sandy beach and many hotels, pensions, campsite and bars. Despite it's popularity, Galissas preserves it's natural beauty and pleasant strolls can be made along the pier or to the country church of Agios Stefanos, built on the rocks just above the sea. The picturesque fishing village of Kini is also west of Ermoupolis and a few kilometers from Galissas. Kini is well known for its beautiful beach, succulent sea food and magnificent sunsets, where the sunlight sparkles off the white houses dotted along the bay, where small fishing boats float on the deep blue surface of the sea and the hills of PanoMeria creating a perfect backdrop. A traditional farming village, 6 kilometers from Hermoupolis. Vari is suitable for quiet, family holidays where visitors can sample delicious traditional snacks and fresh fish in local tavernas. 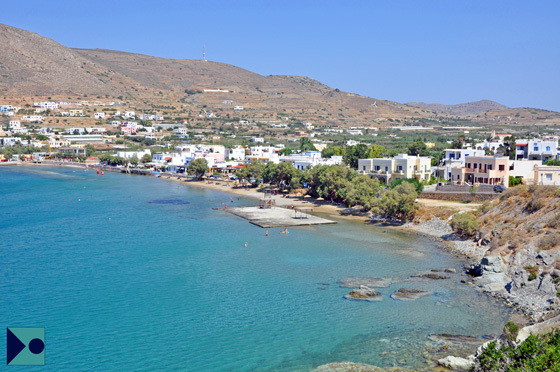 Vari Beach is the most sheltered bay on Syros, attracts many families and package tour groups but modern tourism and tradition manage to coexist without spoiling its natural beauty. Most types of sea oriented entertainment are available at Vari. A Venetian tower can be found in the village and the remains of an ancient settlement were found in the nearby site of Koskonas. 12 kilometres south-west of Ermoupolis, the coastal settlement of Posidonia took its name from the god of the sea, Poseidon, while for some the village is know as Delagratsia, derived from the Catholic church, Santa Maria Della Grazia. Considered to be one of the most beautiful villages of Syros it was favoured by the island's wealthy during the 19th century. Visitors will therefore see quite a number of neoclassical mansions around the village, some of which are open to the public. Near to Posidonia is the village of Finikas. Finikas is a large bay sheltered from the winds and a narrow beach boarded by tamarisk trees it also has a lovely marina, many eating facilities and all kinds of sports, both in the sea and on dry land. The little harbour is a favourite with the people of Syros and tourists alike who like to eat in the tavernas along the seafront or take delightful walks along the coast. Facilities at Finikas include a medical centre, sport facilities such as a basketball ground and a playground created especially for children to play safe. 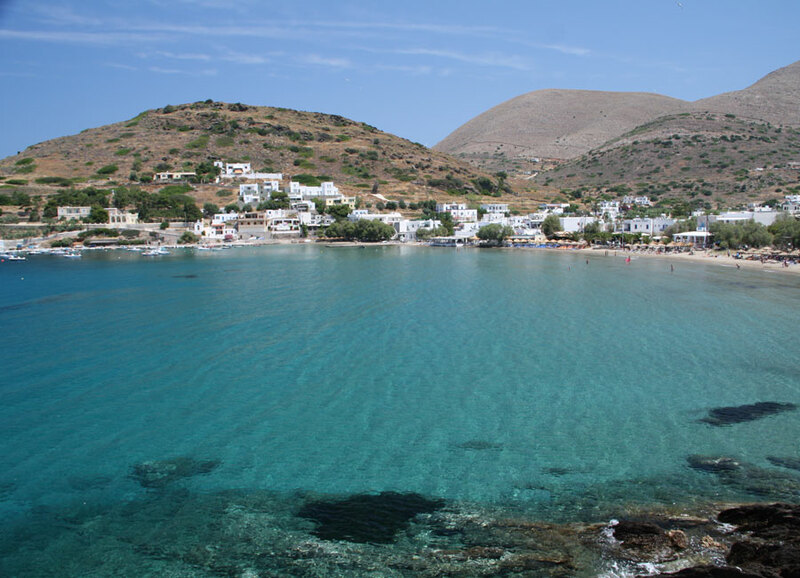 MegasYialos, as the name suggests, is the largest beach on Syros and possibly the prettiest on the south coast. 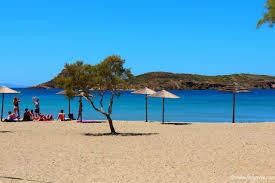 The sandy beach is shaded by tamarisk trees and is especially good for families because it's gently shelved. The beaches of Syros are perhaps not as well known or organised as the beaches of Paros and Naxos for example but nevertheless, there are some very nice and easily reached bays and with a little patience, it's possible to find your own little calm and secluded haven.Other beaches on Syros worth mentioning include Agathopes, a little south of Posidonia; Azolimnos, a small picturesque bay; Delfini Bay, a beautiful sandy beach in the north of Syros; Armeos, rocky beach with some nudism reached by footpath from Galissas; Kini, spotlessly clean and refreshing. Housed in the beautiful neoclassical building of the Town Hall, the museum displays findings from excavations made on Syros such as prehistoric finds from the fortified settlement at Kastri and the cemetery at Chalandriani plus finds from the ancient city of Syros and from other Cycladic islands. 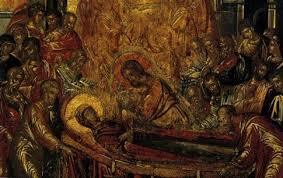 Sculptures, grave columns and inscriptions dating from the Hellenistic period are also on display. A really interesting building with a highly decorative architecture, built by an architect from Syros in the 19th century. The building has been proclaimed as a work of art and encircled by a protection zone extending to the property's boundaries. Located in Ermoupolis, near Miaouli Square, the museum exhibits an interesting collection of Cycladic art and findings excavated on Syros and other Cycladic islands. 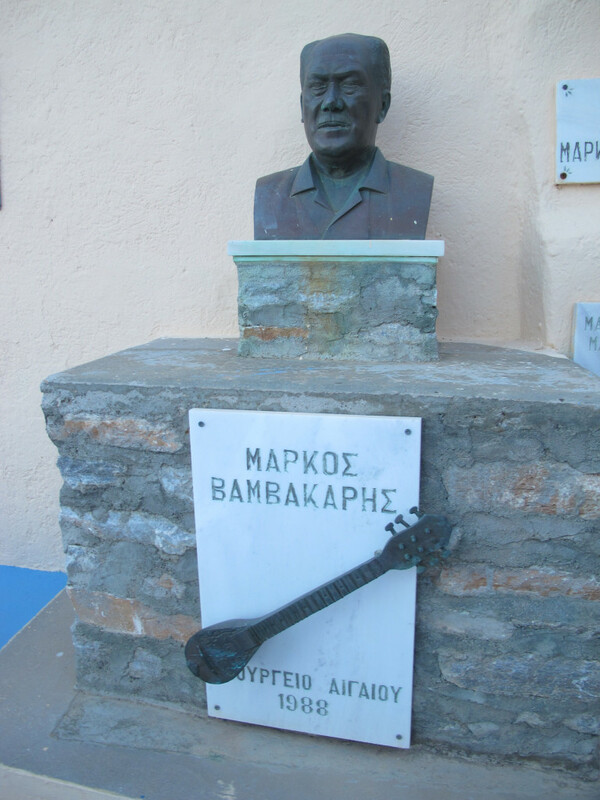 Markos Vamvakaris (1905-72), a famous son of Syros, was a rebetika and bouzouki master. This museum can be found close to Piatsa in Ano Syros and houses memorabilia, records and the personal effects of this most popular composer.